We wanted to close 2011 up with a complete Round Up of The Wedding Chicks. If you are long time visitor or perhaps just stopping by for the first time, here is what we have to offer. Rest assured in 2012 we have even more surprises up our sleeves. The WC Shop- Carries only the cutest custom goodies for your wedding, along with custom kids shirts and the perfect present for that New Baby. We have a lot of wonderful items, but we are known for our $10 tote. Pretty much the perfect welcome bag. Stop by and sign up to learn about sales and fabulous new items, and of course mostly the sales. Style Search- Allows you to search by your wedding colors or wedding style. Along with a mini round up of the site. Free Printables- We are known for is our Free Printables customized in your colors and text! We have a complete collection of everything you will need for your wedding. From the invites, to the menus, to the Bride & Groom signs - we have you covered. Get excited ... In 2012 we plan on bringing in a ton of new designs. If you have any requests, leave a comment and let us know. Real Weddings- Lucky for us we have some really incredibly vendors from all over the world. Each vendor is given access to our site and can post in Real Weddings. This way you can see snippets of their work and of course swoon over some fabulous weddings. 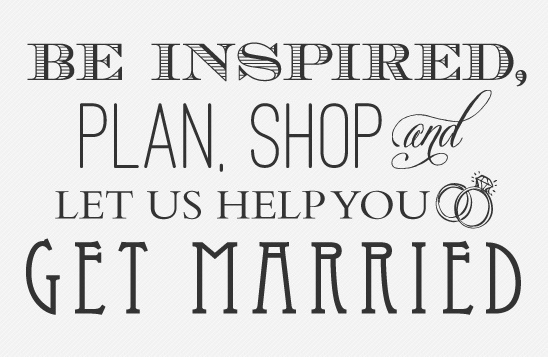 Find Local Wedding Vendors- We like that we are a one stop shop. You can find your all your wedding vendors, learn how to make a french macaron, pick up some wedding favors and find your wedding dress all in one swoop. DIY Projects- If you like to get crafty, we have a ton of diy projects. All the way from flowers to food and everything in between. Wedding Fashions- We are personally in touch with many of your favorite dress and accessory designers. If you need a little fashion inspiration ... look no further, we also have that. Hand Picked Wedding Vendors- There are so many amazing wedding vendors out there, and of course like everyone we have our favorites. There are only a few for each category and each area. They each hold certain qualities that we personally feel are very important in a wedding vendor. Stop by and see who they are.